They occupy sandy deserts and gravel plains, they are nocturnal and thus seldom seen. Feeding exclusively on lizards. Widespread throughout the Arabian Peninsula. Absent from the mountains and interior sands of the Rub al-Khali. Young hooded malpolons (Malpolon moilensis) though have large reddish eyes. They are commonly around 30cm, but can reach 44cm. 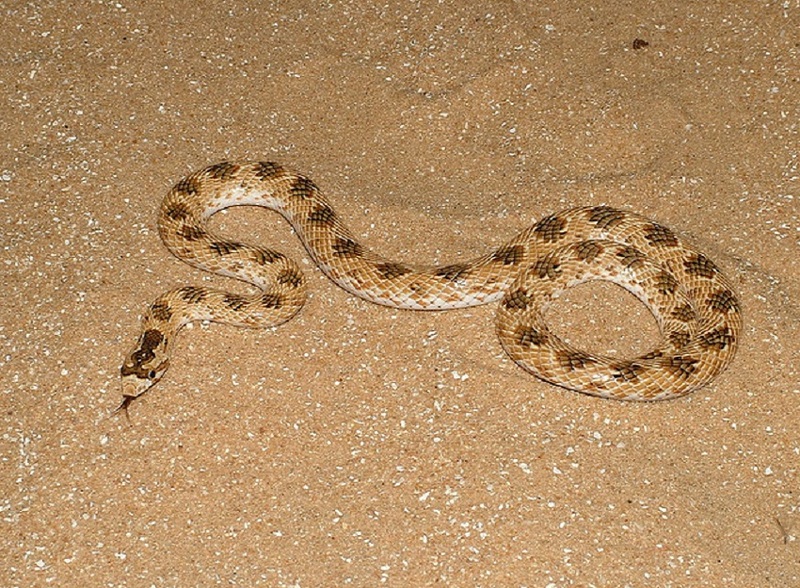 The Head is narrow, the eyes are large with eliptical pupils that do not extend as close to the edge of the iris as other snakes with vertical pupils. They have smooth glossy body scales. The colour varies but usually have a pinkish brown base colour, with 12-18 rows of dark brown patches over the dorsal surface. The ventral surface is white, cream or salmon pink. There is another clour form that is more yellow with red patches.